Welcome to my very first miniatures review on NERD-TREK. In this ( hopefully ongoing) series, we will be taking a close look at gaming miniatures both past and present. Including interviews with manufacturers, sculptors, painters and fellow enthusiasts as well as product reviews and possible sneak peeks at some upcoming miniatures. In part one of this post, we’ll be covering some of the products from Center Stage Miniatures. Which reminds me, I’d like to take a moment and personally thank Matthew Solarz at Center Stage for donating both their time as well as the minis that made this series possible. But enough about me, on with the review…. It was several months ago that I was contacted by the head of Center Stage Miniatures, Matthew Solarz. I admit, I’d heard of Center Stage, but didn’t really know that much about them at the time. When he had asked me what I thought of the minis line, I didn’t know what to say because I wasn’t overly familiar with them…. Curiously, I checked out the website and the thing that struck me wasn’t the miniatures at first, it was the font used for his Advanced Fantasy line. It quickly reminded me of that same style as the font used for the old Advanced Dungeons & Dragons brand. It’s funny, but that was my initial thought; it was at this point I knew to expect something good from this company; and damned was I ever right!? While there wasn’t exactly a huge lineup of products at this point, there were plenty of old-school minis available, including beholders, giants and many large-sized monsters in a mix of both resin and metal. Better yet, you had the option of purchasing almost any miniature cast from either one, with the exception of only a few select figures. Most of the people who’d done the actual sculpting on these we’re very familiar to me. Names like Jason Wiebe (from Reaper miniatures), Julie Guthrie, Tim Prow, Nicolas Genovese ( who I didn’t really know at the time), and Patrick Keith, amongst many others. Now I’m sure most of you already know this, but simply looking at a miniature from an on-line photograph doesn’t often do the right amount of justice. In order to get a fair assessment, you have to have them in-hand to make a more accurate judgement. As a result, Center Stage Miniatures was kind enough to donate some of them for this blog review just for that very purpose. So, what did I honestly think of them?…. Well, I’d like to start by saying that these figures are not necessarily for beginners. I’ve seen a lot more advanced stuff out there, but these do require at least some skill and a little patience; but in this case, they shouldn’t be too difficult at all for the casual enthusiast. In fact, some of them require very little assembly, if any. 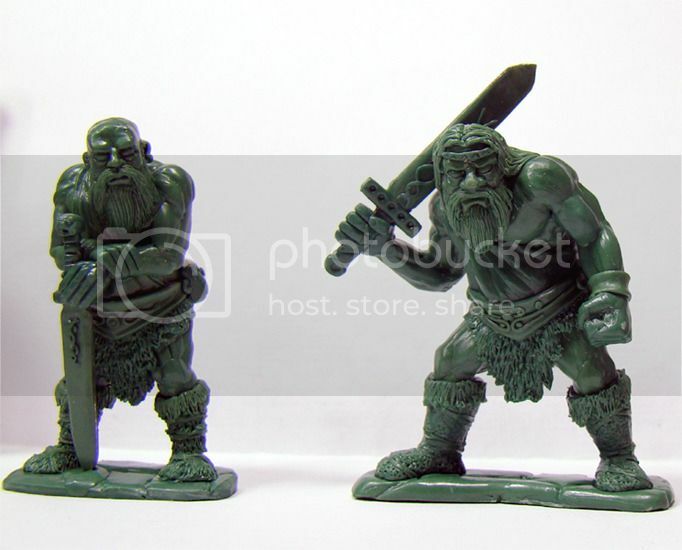 Comparison-wise, they look really nice standing next to miniatures from Ral Partha, Otherworld or Reaper, fitting in well with both the 25 as well as 30 millimeter standards. But, as I was saying, the pictures did not do them a ton of justice, these look so much better in person and in my opinion, they’re definitely worth the asking price. Out of the several that I have in my possession, the two firbolgs are perhaps some of my favorites. One of them carries a giant Celtic-style broadsword, positioned in an almost relaxed pose, but still appears ready to strike at a moments notice. While the other, seems to be anticipating a fight. Since the old-school AD&D firbolgs are mostly neutral, these poses display them in a very natural, almost-realistic state. Each of the two firbolgs stand at roughly 40 millimeters in height in a slightly hunched over position. They’re both supported by metal flagstone bases that provide a nice solid piece. The only assembly required are the swords for each giant. Both firbolgs are sculpted by Nicolas Genovese, whose work I wasn’t quite familiar with until recently, but because of his work on these giants, he now commands my respect as a sculptor. 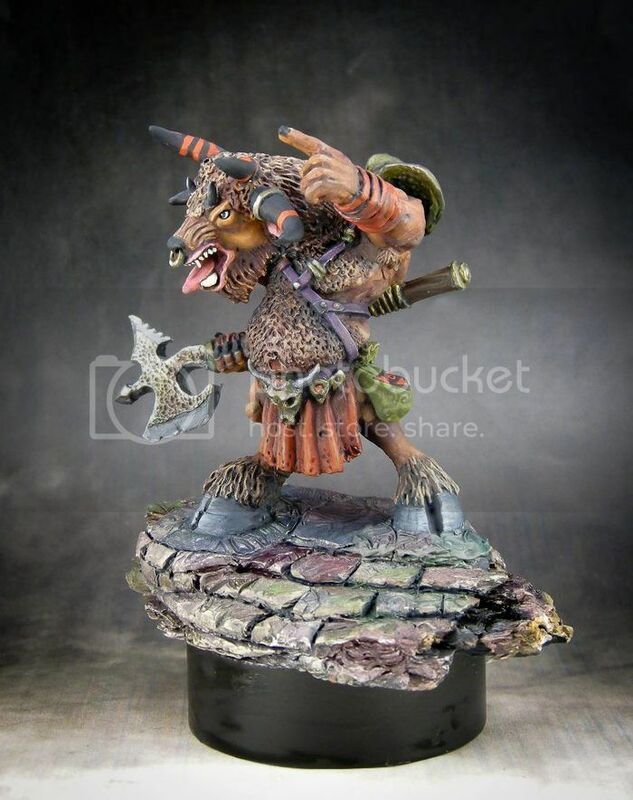 Both firbolgs come in a single pack and are available in either lead-free metal or resin (buyer’s choice). Next up is a water weird sculpted by Jason Wiebe. It’s cast in two separate pieces, one being a stone well, made with a grey resin that features a hollow niche for the elemental to fit snugly in place. 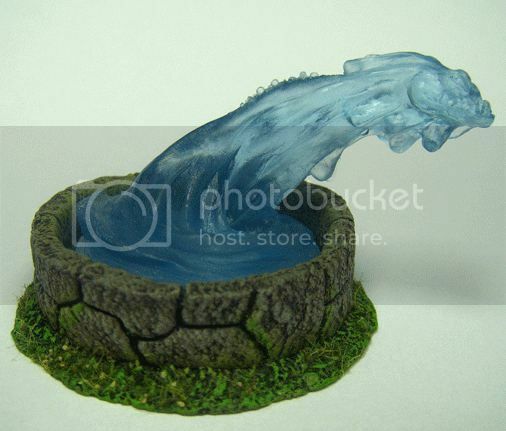 The elemental itself is cast from a clear blue resin which makes it appear very close to being made from actual living water. I really like this piece for several reasons. The first being that it doesn’t require much prep work or too much painting and is extremely easy to assemble. And secondly, it looks fantastic! Over-all, it’s a really nice sculpt, fondly reminding me of Larry Elmore’s painting for the cover of Dungeon of Dread. Last but not least, is one of the miniatures featured in Center Stage’s demons and devils line. And that miniature is none other than Baphomet, Lord of mazes, prince of beasts and ruler of the 600th layer of the Abyss, Baphomet is quite stunning in all his resin glory! Easily dwarfing the firbolgs by a few heads, he makes their giant swords almost appear like small daggers by comparison. Speaking of comparisons, I sat this one side-by-side with my older version of Baphomet (the one from my old Ral Partha Planescape boxed set) and I admit it, I like this one a hundred times better. It’s big, bulky and much more menacing and actually looks a bit more like Baphomet when compared to a skinny little minotaur with a cod-piece and an axe. This mountain of a mini ( 65 millimeters) comes in three separate pieces. The torso, the head and an arm. With a little work ,the arm can be positioned in various angles, which could say something along the lines of “You’re next!” or “I’m number one!” dependable on the angle you decide to pose it in . Baphomet is sculpted by Jason Weibe and is sure to be a hot seller. So what’s my verdict on Center Stage Miniatures? Honestly, I think they’re definitely on the right track. With miniatures this good and at this level of quality, there’s certainly potential to make CSM the next big thing in old-school minis. And as for those of you who haven’t been keeping track, Center Stage will soon to be releasing a plethora of demons and devils into the line, including succubi, a night hag, Amon and his Winter wolf, Ice devils, Horned devils…I could go on with a list this long, but instead of me telling you about it, check out the website for yourself. You can find them by clicking the link below or look for them on Facebook . Remember, keep watching for part two of this article, there’s a lot more to come and maybe a few surprises in store. Until next time, may all your rolls be perfect 20’s! Special thanks to : Jason Weibe, Nicholas Genovese & last but certainly not least, owner and operator Matthew Solarz.